Having tasted the best Peking Duck in the world (in my opinion) at Peking Duck, Private Kitchen in Beijing, I was on the search for perfection. And it was exactly how I remembered and imagined it to be. Epic! The wafer-thin skin was so light and crisp it was more like eating light layers of duck crackling. No fatty bits whatsoever. The meat itself was beautifully moist and tender and flavorful. Perfect! Oh. My. Gosh. My eyes nearly popped out of my head when I tasted the first bite of my succulent homemade Peking Duck. Having tasted the best Peking Duck in the world (in my opinion) at Peking Duck, Private Kitchen in Beijing, I was on the search for perfection. And it was exactly how I remembered and imagined it to be. Epic! The wafer-thin skin was so light and crisp it was more like eating light layers of duck crackling. No fatty bits whatsoever. The meat itself was beautifully moist and tender and flavorful. I just wished we’d made more pancakes! The challenge was set for me by a friend (E) who was coming over for dinner. We’d decided to have Peking duck while watching Masterchef and without giving it much consideration I committed to making it myself. I googled some recipes (here, here, here and here) and was astounded to find that the process, in some cases, takes upto 10 hours. I knew I needed to come up with shortcuts without compromising on the quality of the finished dish, so in my true food adventurer style I did. If there is one thing I’d improve on in the future, and yes, I’ll be making this again, it’s the hoi sin sauce. We used a store-bought one and it tasted slightly odd. It was ok with the pancake, but could have been much better home made. The recipe is easy and prep is quick if you follow these five steps: clean, marinate, hang, refrigerate, roast. Having said that there is a few hours of "wait time" involved so its best to try this on the weekend. You won't need meathooks or fans or bicycle pumps (! ), called for in other recipes, just some kitchen string and a roasting tin with a rack. Note: 3 of the ingredients repeat in the recipe, so just be aware that you will need 1 whole lemon, 10cm knob of ginger and 3 tablespoons of five spice in total - divisions are listed below. Note: roasting times are 1 hour per 1 kilo of duck. Combine water, cooking wine, sliced lemon and ginger, five spice powder and brown sugar in a pot or wok large enough to fit the duck lying down. Bring to a boil, stirring occasionally, and cook for about 15 minutes to infuse the flavours. In the meantime, prepare the duck. Wash the duck under cold running water and pat dry all over with paper towel. Cut out any excess fat around its bottom cavity. To separate the skin - this will make it beautifully crisp and fatless, gently lift the skin with one hand and poke and slide your other hand in-between the breast meat and skin until you reach the neck, ensuring you don't tear the skin through but it has detached from the flesh. Turn off the heat under the marinade. Place the the duck into the liquid for 3 minutes and spoon it over any parts that are not submerged. Turn the duck over and repeat the process for a further 3 minutes. Reserve the marinade for roasting. The other important step to getting a perfectly crispy skin is making sure it's dried out before roasting. Pat dry the marinated duck with paper towels. 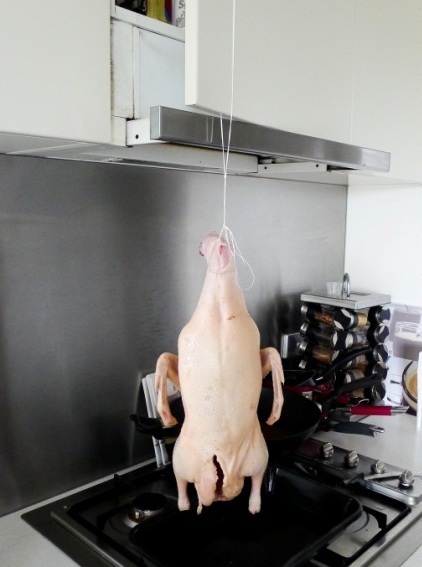 Tie a long piece of string around the bottom of the duck's neck and hang it up over a roasting tray in a well ventilated place to drip dry for about 1 hour. I did this over the stove attaching the string to a cupboard door. Pat dry with paper towel again. Transfer duck to a roasting rack positioned over a roasting tin and place uncovered in the fridge for at least 3 hours. This will help dry the skin further. Preheat oven to 170C fan forced (190C, 375F, gas mark 5). Place ginger, lemon and star anise inside the belly cavity, cover with excess skin and cross the legs, securing them up with kitchen string. Sprinkle 1 tablespoon of five spice onto the duck and rub it into the skin. Place duck on a roasting rack inside a roasting tin. Add 2 cups of the marinade to the bottom of the tin to stop the fat from splattering. Cook on the lower middle rack for 1.5 hours at 170C fan forced (190C, 375F, gas mark 5). I turned the tray around halfway through roasting for an even "tan". Then turn the heat up to 190C and roast for a further 10 minutes to crisp up the skin. In the meantime make the pancakes. Using a spoon mix flour with boiling water in a bowl until it starts to form a dough. Turn out onto a lightly floured surface and work for a couple of minutes until there are no lumps. Cover with a plastic freezer bag and refrigerate for 5 minutes. When ready, knead the dough for a couple more minutes and form a log. Cut into 12 even pieces. Flatten each dough ball with your hands, dust with flour and roll out to about 2mm thin between 2 sheets of grease-proof paper. Peel the paper away, grease one side of the pancake with some sesame oil and set aside. Continue with the rest of the dough, stacking the pancakes on top of one another for frying. To fry, heat a small frypan on mendium heat and cook each pancake for about 20 seconds on each side or until they start to rise gently and get golden spots. You don't want the spots to go to dark though. Cut the duck in half down the middle. Gently lift off the skin, place on a clean roasting tray, sprinkle with sea salt and grill for a couple of minutes to keep it from going soggy from the steam of the meat. 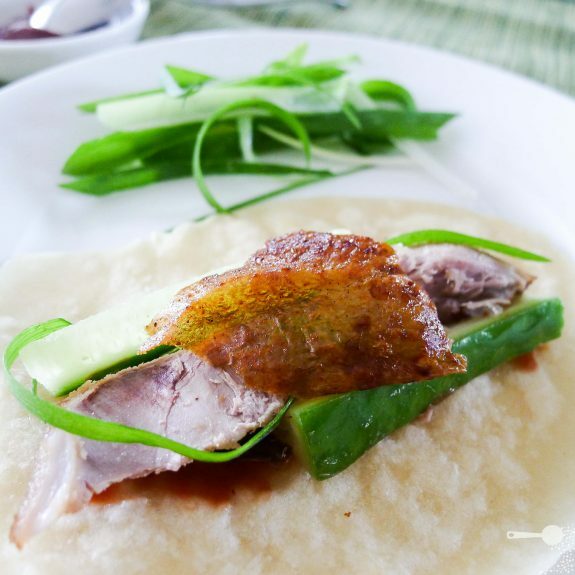 Slice duck breast and leg meat and arrange on a warmed platter alongside finely sliced cucumber sticks, shallots, pancakes, crispy skin and hoi sin sauce. Smear each pancake with a teaspoon of hoi sin sauce, top with cucumber, duck meat, shallots and duck skin crackling. Wrap up and enjoy. Checkout also this cool infographic by The Thinking Insomniac! How cool is that recipe now? O.M.G – I WANT THIS but i rarely eat duck. Hey there, thanks for stopping by my blog! Lol @ the bicycle pump – Stephen and I were going to try the Heston Blumenthal recipe until we decided it was too much hassle. You did a great job here! Thanks and no probs! There was also a suggestion of blowing the skin with your mouth! Yeek, no thanks! WOW. Great post. I’ve been planning on giving peking duck a shot myself but the time demand has always been a factor. I’ll definitely take your techniques into account when designing my own recipe. Thanks Stephen! You should really give it a go. I’d take a chance of saying you could marinade and refrigerate the duck before going to work then roast it up at night. Might be worth a try. Just exquisite! This is one of my all time favorite dishes. Your step by step makes this recipes seem lees daunting! OMG you told the world about my sad little triangle pancakes! Thanks again for the best peking duck i’ve ever had (and i’m kind of an addict). Although I’ve never been to China 🙂 Photos look great. If you ever need help getting those triangles ‘just right’ I’m there! Thanks E! If I make it again I’ll make sure we have it warm – no picture taking! Haha! And you can make all the pancakes! I’ve never attempted duck before…seemed so daunting to me ! But this recipe definitely seems doable. Thanks for sharing! You are welcome. To be honest I felt the same way when I did my initial recipe search, but then I thought, why not improve on that and make it easy. And it was. i love your articles. fab pics and easy directions. its such a shame i’m a rubbish cook or I would try some of these. That looks amazing. Your patience and diligence certainly paid off. Peking duck is excellent and I’m gonna try this recipe. Stop by my blog here on wordpress. you are making me hungry and it’s 9am my time. Wow. I wish I could be eating this right now! Tasty.Very tasty. I should try this cooking for my friend. You don’t make friends with salad… but you can with this! Haha! Enjoy! Im glad you were featured on wordpress – I may not have found you otherwise!! Awesome blogsky! Thank you for a great post! I was living in Beijing before and frequently came to the most famous Peking duck (Kao Ya) in the Xuan Ju De restaurant. Then I continue to order Peking Duck in all Chinese restaurants here in the USA and other countries as well who has it in their menu but none of them can beat the original Peking Duck in Beijing! The most difficult part is to make the wrap (you called it pancakes) right. 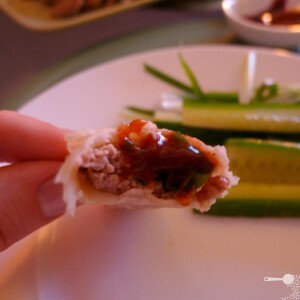 If the texture of the wrap is not right then it can ruin the whole experience of tasting the Peking Duck. The skin is also play an important part. For most people who has never tasted the original Peking Duck from Beijing can not tell the difference, that the secret is in the wrap! Interesting point and I tend to agree. Although for me it’s all about the skin first, pancakes second. They need to be thin as well so that simply act as a vessel for what’s inside. PS Lucky you for having experienced Beijing more like a local than a tourist. Haha! Sorry… but then again it may be an incentive to try making it yourself indeed. It’s not very hard – feel free to email me if you need anything explained further. Maybe it tastes better than the real deal. To begin with, I’m no fan of duck. I’ve tried Peking duck in Beijing. I was unimpressed and rather not pleased… but then I’m not a big fan of Chinese food either. And I had just spent a summer in China, eating a whole lot of real Chinese food. Needless to say, I think I lost several pounds that summer. I guess some of the spices and flavours can be overpowering to the Western palate. You could try plum sauce instead of the traditional hoi sin. Or just leave it a couple of years – tastes change. Spices and flavors had nothing to do with it. I actually like pot stickers/dumplings. jhowtzah? I’m Cajun. I can handle spice. Duck is just fatty and I’ve never liked it. The sauce they served tasted horrible – but I’m not big on condiments. No, real Chinese cooking just doesn’t appeal. I don’t know how often I was served dah-pan-ghe… “plate of chicken”, which tasted okay but was a royal pain to eat. The whole chicken is diced up and cooked… and you have to eat it with chop sticks. Trying to de-bone a piece of chicken in my mouth or off of the chop sticks was utterly time consuming and unappetizing. I can eat with chop sticks – I had to – but it just took so long to get anything that it just wasn’t worth the effort, so I ate less than I normally would… unless I was eating Muslim, Uyghur food. Then I could usually “pig” out. This was in 2002 that I was in China and I was no fan of Chinese food on a regular basis then. Nearly ten years later and my tastes have not changed. My love of some Islamic ethnic foods however are going strong – though a traditional Uyghur sausage left a lot to be desired (tasted okay but smelled like poop – made from real lamb’s intestine). Ok, so the issue is the fattiness and bones? I’ve had some bad experiences with Peking duck where there were just layers of fat, connective tissue that was chewy and indeed, the duck was served on the bone which made it impossible to eat let alone enjoy using chopsticks. That’s why I made sure that my version had none of those annoying bits. As far as condiments go, I am a big fan so that makes a difference when it comes to the sauce. I guess some love duck, others don’t. I so want to make this. It looks great! Wow this looks so good. I will have to try it out! Thanks! And yes, I thoroughly recommend duplicating. And welcome to pop back with any constructive criticisms. i’ve never tried duck, but this looks amazing. might have to get crazy and try it out! You should try it – duck isn’t at all an offensive flavour. It’s rich and flavourful, a little like the dark meat on the chicken, just slightly more earthy in flavour. Good luck, hope you love it! I love duck. I mean LOVE it. I tried to cook it once and almost burned my house down. I’ll leave it to the experts. I want someone to make this for me! Congrats on undertaking the multi-step Peking duck prep. Your results look delicious. I made it some time ago using the hang it in the window and use a bicycle pump method. Here is the true explanation of how it got its name. Haha! I love the story! I thought it may be a bit of a gruesome sight for kids, but they obviously don’t think on that level. My duck came headless – it would have been a little traumatising to look it in the eyes, even for me I reckon. Thanks for sharing! Just beautiful! I love the pics and the step by step instructions. You make what could be a difficult and time consuming process look so easy! Thank you, when I first thought about it and looked up the other recipes it did look daunting. But the work is only in the marinade making and marinating. The rest is just waiting time really. Well apart from the pancakes! Thank you! E and I were actually saying that the flavour of duck is not at all “offensive” It’s richer than chicken but it’s not gamey at all. And cooked right, all the fat melts away leaving succulent meat and crisp skin. Yymmers indeed! oh my god! I really like to try this. I know there are some chinese restaurant in Vancouver BC provide Duck pancakes. Your post attract me want to try it. Thanks! You are lucky that they would, I tried to procure some pancakes from the Chinese grocer but they pointed me to the fluffy breakfast type – not sure they understood what I meant… If you try, enjoy every bite! ive got to save this and see if one day we can make it absolutely brilliant! Your recipe looks amazing; it’s now bookmarked, and I cannot wait to try it out! Sometimes I make roasted duck, but it’s usually a frozen bird because, as you mention above, I don’t see many fresh ducks. Happy cooking and thanks for sharing the great recipes and photos. Thanks and good luck! I think with a frozen duck you just have to make sure it’s well defrosted and patted dry a few times before marinating – frozen stuff tends to retain moisture a lot more. I would let it dry in the fridge for an extra hour too. Just to make sure. This is so inspiring!! I was in Beijing a few years ago, but at that time I was vegetarian and so I didn’t try the Peking duck. (My husband devoured some, however.) Perhaps I’ll make up for lost opportunity and try this as a weekend project someday. Great photos and instructions! Thank you, I told Mr Chpconnoisseur (my boyfriend), who is scared of tasting duck he now has no excuse but to try it! Enjoy. Doesn’t hurt asking around… do they come to growers’ markets? Hi Petra, thanks. Unfortunately there is gluten from wheat in the cooking wine, but maybe there is a gluten free version out there, I just haven’t looked. I am sure I could find an alternative! It would be good for me to make actually as I can never order duck when eating out due to the marinade. Duck is one of my favorites, and my parents used to make this…I would love to have it again! The peking duck I make is so complicated compared to this but yours sounds even better. Mine has to hang for 24 hours and the pancakes are delish but somewhat complicated. Scallion pancakes. I have to try this. Thank you – I make my scalion pancakes from the same recipe, just add scallions (aka spring onions, aka shallots). 24 hours? That’s commitment! Now I am starving! Thanks for sharing the pictures. Oh my my my. There’s a restaurant here in Phnom Penh that does these Peking Duck pancakes superbly. Like, really superbly (or perhaps it’s just superb for Cambodia?)! Anyway, I have a feeling that I’ll be making a trip over there sometime soon because after seeing these photos I’m practically drooling all over my keyboard (…just kidding)! Mmm… Peking Duck Pancakes. I can’t wait for lunch now 🙂 Thanks for sharing this! I’m sliding this into my bookmarks so that I can find it if ever I want to try making them at home! Heh heh your comment made me smile. I’m sure the ones you’ve been trying are great – only the great ones get “superb” reviews. Congrats on FP. Are big pictures a key to being featured? 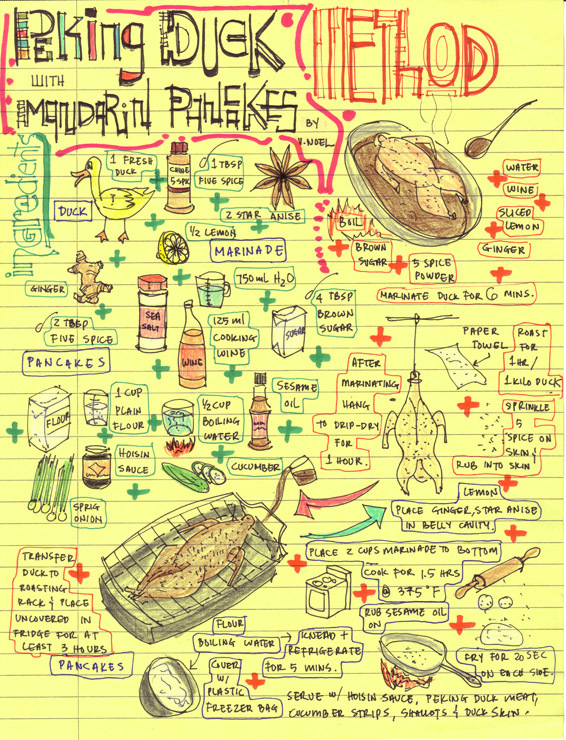 Mandarin pancakes, are you serious??! I HAVE to try some of those. Thanks for the (entertaining) recipe, I’ll definitely be forwarding it to my boyfriend (a chef) so he can cook this up for me one night! WOW, this looks amazing! I will definitely have to give it a try next time I’m having company over. Thanks for the great idea! Good luck! I tried to make it simple but delicious because I’ve found other recipes daunting as well. Enjoy! I love Peking duck but being stuck here in Berlin highly lessens the chances of eating anything close to a decent Beijing Kao Ya. Thank you for being brave enough to make this at home! You’ve shown the rest of us it can be done without having to open a restaurant – or inviting a Chinese chef for dinner 😉 Love it! Thanks! now you can enjoy it too… or open the first best Peking duck spot in Berlin! Oh stop it! You’re making me cry = thank you! I’m an avid duck-eater and I am sooooooo badly drooling over here. Great going! I dont eat duck. I will replace it with chicken. You nailed it gal! My mouth is watering now…this is a tough one and even your duck would be proud (RIP). Congrats on a great recipe and for being Freshly Pressed, my dear! Wow – i think this is on the menu Friday night! It is making my mouth water just thinking about it! I wish I could be eating this right now! Tasty, tasty, my family loves Duck I will have to try this. Thank you so much. The duck looks delish!! and the pancakes… would love to make those as well! Thanks for the inspiration! Looks delicious! I love eating Peking Duck. This brings back amemory of the duck wraps I had last year. Very tasty. I wish I was brave enough to attempt making this…. I had my first Peking Duck in China last August. It was divine! This makes my mouth water. I’ll be back….. Thank you and please stop by again. Nice pics – I never would have thought of doing this kind of dish at home. Don’t want the hanging duck in my kitchen, but the duck in pancakes? Yes! I have to say hanging the duck was probably the “worst” part of making the dish… but it was sooooo worth it! This sounds simple – and amazing. Silly me initially thought the pancakes had mandarin oranges in them. Which surprisingly sounds kind of interesting. Lovely post. I love peking duck, but don’t like duck in general. I think it’s the combination of the pancakes and the other condiments. Do you have a good recipe for the bao dough? I like that as well. Hi Lafemmeroar, no steam bun dough recipe as yet… I’m still a novice to Asian cuisine so I stick to the basics. I’m sure others have made it though – have you tried googling? You’re one up on me. My bread making frenzy began recently and stopped just as suddenly – with my first loaf. When it comes to savoury and non-bready foods, I am pretty good at judging what will and won’t work. Breads are a whole different story! But thanks for your kind words. They made me smile. Good luck and let me know if you find a goodie! It’s great! I’m from Beijing and living in Texas for six years and your post make me soaking up old memories. Since it’s very complicated to make a peking duck, nobody in China (as I know) would try to make it at home… but your approach is definitely worth to try… especially in Texas… your dish looks more authentic than those made by “American” Chinese restaurants here. Great work! I always love to eat ducks. But we cook it in a usual way. You’re recipe gave some kinda twist on how to cook a duck. Thanks for sharing this one. Surely I’m gonna try it. Wow! As much as I love Peking duck, it never would have entered my mind to try making it at home since I had assumed that the recipe was superlatively complicated, but you make it at least look feasible. Hanging the duck over the stove is a great idea, but I wonder how I can keep our four cats from attacking and devouring it…lock them in a bedroom during the “hanging phase”?? I guess I’ll also have to remove some of the contents from our refrigerator and keep them in a cool box during the “chilling/drying phase” too. I’ll give this a go as soon as my little cucumber plants start producing. The onions are ready now. Congrats on getting “freshly pressed”! Thank you! LOL – yes cats should be locked in a spare room during the hanging phase, definitely. I love that you can grow your own veges – good on you! That dish looks really great! I love a good Peking duck. Seems to be a nice recipe, but, sorry, it’s NOT Peking Duck – it’s “Peking-STYLE” Duck. You can not say you’ve made a famous national dish if you’ve changed the method. 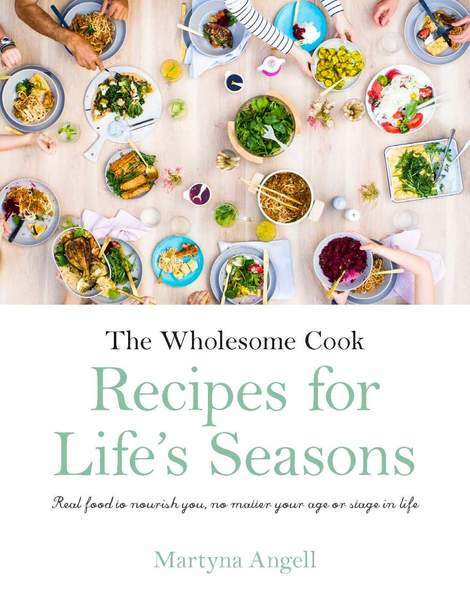 Truth in cooking is a chef’s Hippocratic Oath – I know, I’m a chef and a food writer. Please change the title and be honest. Hi Marc, thanks for your comment. I do appreciate that this is not the real Peking duck, hence the use of the adjective “homemade” rather than “traditional”. By this logic, if I pan-fried my beef patty, would I have to call it a hamburger-style dish because it hadn’t been grilled i.e changed method? Is every pizza or spaghetti Bolognese made exactly the same way to be able to bear the name? In fact, just like Bolognese, Peking duck is a regional but world-famous dish. My recipe and post clearly state that I’ve used shortcuts. I am not a chef, nor a historian (or doctor), but I enjoy good food. If you look at the other recipes I have linked to, some by world-famous chefs, they all vary in their ingredients and methods, quite substantially even, yet they are all called “Peking duck”. Some not even annotating the difference in the method – should they be changing their titles too? Perhaps. But the focus of their and my “homemade” recipe is on making the dish accessible to home cooks without the special ovens and other contraptions required to make traditional Peking duck. And mine is, at the same time, making sure that some of these traditions are taken into account. Serving of crispy thin skin alongside, and not attached to the meat is a highlight and an example of such purpose. As such, I feel I am representing a home-cooked meal and not the traditional recipe, and I have stated this at every occasion in my post. I think you are just a food snob……I am really looking forward to trying this recipe, and I’m sure I will love it despite the name!! You did it!!! That looks pretty spectacular. I must say, you are brave :-). I would never have the patience. That skin is legend! Look at how crispy it is. Awesome work Martyna!! YOU AMAZED ME! YOU AMAZED ME!!! ABSOLUTELY ~you know, peking duck is my favorite, i have enjoyed it every time i went to beijing, it really made my mouth watering, BUT, i never thought people could make peking duck at home, AWESOME! it’s so unbelievable, but you did it, how amazing!!! Great work! Thank you, we are just elaborating on whether I should change the title to Peking-style duck, because the preparation methods are different, eventhough the flavour and serving method are very authentic. I am going to try this! I love to cook! Wow, girl this is amazing! I recently tried making char siu at home. Was so pleased wit it. I must give this a try! Thanks and I saw! I just haven’t had a chance to read all about it – somehow I’ve been flat out?? Tomorrow. Your post was very inspirative and very well written !! I will continue to come back to your blog to see what articles you have in the future ! !Great graphics that kept my attention. Well done! Thanks for sharing! This looks sooooo good. It reminds me when we went to Mr. Chow’s for my birthday last year. Looks great! We always make mandarin pancakes for Thanksgiving leftovers and I always burn my fingers making them because my recipe calls for rolling two together with oil in between. You get them thinner this way but…ouch. Hey, I just hopped over to your web site through StumbleUpon. Not somthing I might normally read, but I liked your thoughts none the less. Thank you for creating some thing well worth reading. Thanks for sharing content to read. Thanks for a great story to share. I would like to expand your idea further, and will digging out more for further details. I’m a fan of fried duck dishes. Peking duck one of my favorites. especially if you cook it produces duck meat is tender and delicious. very interesting recipe. Thank you. Hi Abbie, my 1.88kg duck had enough meat for 12 generously filled pancakes, you could probably get 16 out of it, which would mean that you would get 2 filled pancakes per person. As an entree that would work. As a main, I’d suggest getting some Luv-a-duck ready to eat Peking style breasts, chopping them up finely and making a second course of a san choy bow. Hope that helps! Have a great party! made the pancakes tonight, we want to use them tomorrow – how should I best keep them ? Hi there, best to keep them in a plastic zip lock bag with some baking paper on between. Hope you enjoyed them. indeed they did, thank you very much. Boy am I glad I found this website, it is so delightful to find kindred spirits and correspond so easily. I have to admit I was to chicken/lazy/busy to do the duck myself, bought a finished frozen product at my vietnamese shop around the corner, and made the duck sauce myself, my son thought he wouldn’t touch it and I had to make it all again this weekend ! I have made this twice now and it’s absolutely perfect! Both times it turned out exactly as stated here. I bought a bird from Woolies both times with no problems – 2kg each. I’ve now got the reputation as the guy who can actually cook duck!